Here we see a glimpse of where my new rhythmic offerings may head in the not-too-distant future. At the moment the DRM1 Major Drum is being released - the DRM1X MD Expander (far right, joined internally to the DRM1 next to it) comes in a bit - and then there's the MiniSeq prototype far left (still somewhat early days, but almost fully formed). I wouldn't usually show such early prototypes, but feel it helps the release of the DRM1 to know roughly where things are headed. There may well be other DRM modules down the line..
And likely further gating/sequencing utility modules because that is a key area for me. Final row - Sync input for the VCO (switchable internal [previously an internal jumper] or external), switching for LP/HP VCF response [replaces internal jumper on the standalone], VCF-side extra triggering (thanks to Daren Ager for this suggestion - what a bonus!) which allows you to disconnect the VCF envelopes from the main trigger input and trigger them separately, thus making the single DRM1+X almost like two individual drum voices. 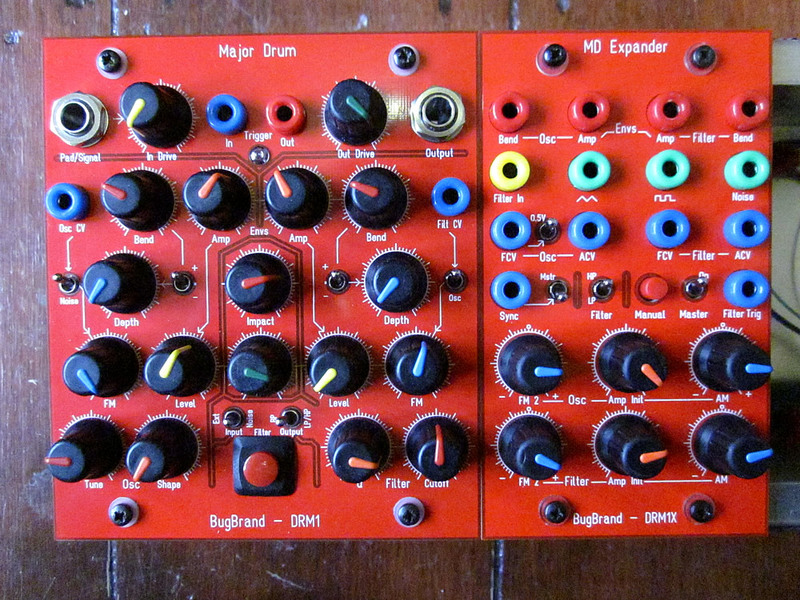 A compact but super-powered CV & Gate sequencer! While it is 'only' 8 steps, the control possibilities mean it can jump and dance like no other. This is an area where my modular clock/logic investigations have been simmering away nicely over the last few years.. If you listen to the various DRM1 demo sounds on soundcloud you can hear how things JUMP. excited for these. i need a row of red bugs! D1000 - dunno... would have to read up on it. Actually, I think I had the prototypes in the same room as a D-1000 last year, but.. a few meters separated them - missed opportunity. judging the DRM1 demos, i think it will sound great with the the D1000. whether or not it works technically remains to be seen, but I don't see why the d1000 couldn't trigger the DRM1. having just purchased a DRM1 i guess i'll find out! Damn! That sequencer looks like it's punching way above its (width) weight class. Just to find out if I understood this correctly: You plan to release these as stand-alone units (with sequencer and all) and maybe additionally as modules? I ask because I find the concept of small stand-alone boxes quite interesting! Well.. I started originally on the DRM1 design at least a year ago but always with a view that there would be other associated parts. The DRM1X came in to shape once the DRM1 was well underway. And the MiniSeq, kind of later still. The DRM1 definitely aims from a standalone/module stance, but with larger system approach in mind. 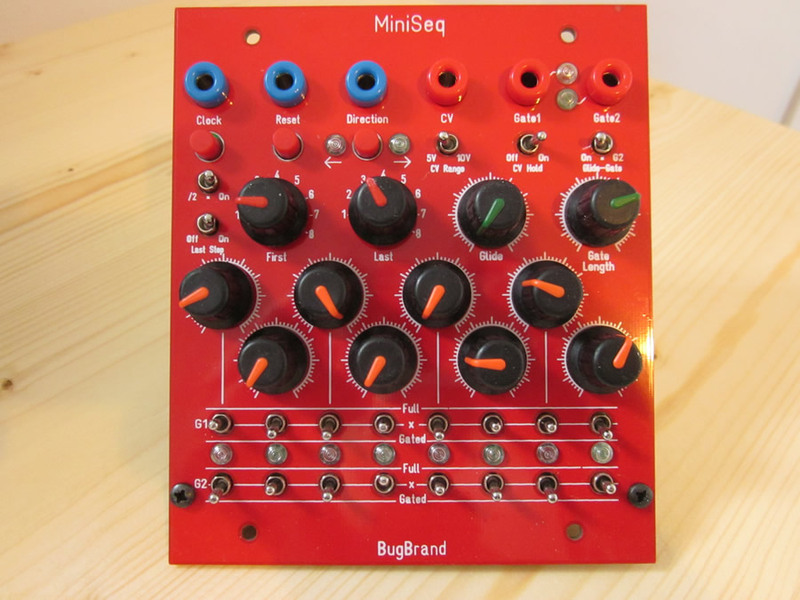 The MiniSeq - well, it could be standalone, potentially, but I think that due to things like bananas, it does make most sense within larger setups. As I mentioned, this is kind of the first iteration possibility of a DRM centred setup - yes, aiming as a self-contained unit. But I'm also thinking on other constituent parts - likely, though, to focus most on this setup for now - focus on things achievable in relatively short time-frames (but also bubble new ideas at the same time). Ha, that's not a very straight up 'this is it' answer - but I guess that shows my evolving working ways to some extent. In essence - the parts are building blocks that can be used as-is in studio/live applications, but they could also be cojoined into bigger bug-rhythm-systems. crap! missed it. end of february cant come soon enough. Tom this system looks truly beyond stunning. I've long been disgusted with the innovation in drum machine technology, or lack thereof. I consider this gap filled. Excellent work. i've had the DRM1 for a little bit now and i have to say - wow! it is awesome. nice work as always, tom! My first bug with an osc, the thing is amazing!